Looking for an example of our products installed? Take a look on our project gallery. 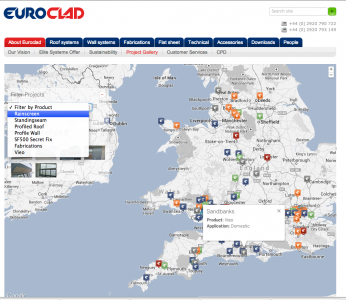 You can choose the product type and application from a simple drop down menu, with the search results shown on a Google Map. To view images just click on the thumbnail images shown on the search results pop up box. There are over 140 project examples to choose from. Around 500m2 of Vieo has been installed at an exclusive courtyard development of six individually designed homes in the heart of market town Garstang. Manufactured from Colorcoat Prisma pre-finished steel in Anthracite, Vieo is the perfect complement to the traditional materials being used, a combination that produces a visual appearance that is crisp and modern but also fits into the local surroundings. 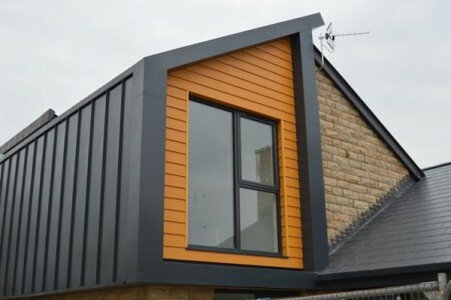 These high specification properties are due to be ready for occupation by Winter 2013 and the installation of Vieo has been carried out by Total Roofing & Cladding (NW) Ltd.